Illustrated in the Korck Publishing wall poster “Freshwater Fishes – Southern Africa – all the Larger Indigenous and introduced species” are 107 species which range in size from upwards of 150 mm to over 1 m.
About 20% of Southern Africa’s larger indigenous freshwater fishes are suitable angling species, to which must be added the alien species (such as trout and bass) introduced over the last 150 years specifically for angling purposes. Suitable angling species are clearly denoted on this poster. As with the smaller fishes, the colours of the larger freshwater fishes are almost unimaginably beautiful, ranging from vivid rainbow colours to the palest pastels. 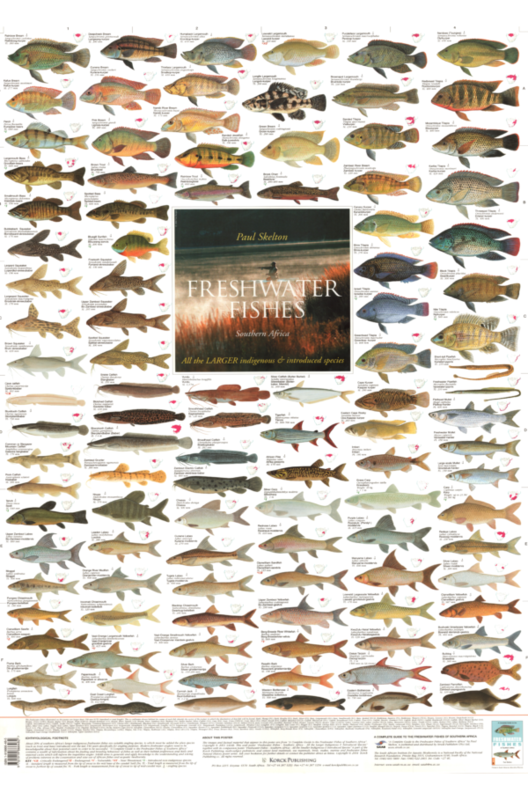 In the two Freshwater Fishes – Southern Africa wall posters you will see southern Africa’s freshwater fishes represented as never before, with a clarity and brilliance of colour and form only heretofore known to scientists.